Manhattan Beach Marriott is a luxurious golfing resort hotel located in the exclusive South Bay Area, just minutes from LAX airport and beautiful Hermosa Beach. Featuring a stunning 9-hole golf course, state-of-the-art fitness facilities, swimming pool and sauna, this hotel provides an elegant and enjoyable experience for travelers of all kinds. South Bay is the sun-kissed playground of LA’s movers and shakers, and guests at the Manhattan Beach Marriott are treated to the same level of upscale living, even if only on their vacation. On-site parking is available for a nominal fee, and for a more indulgent experience, valet service is always on hand. The hotel’s pet-friendly policy allows owners to bring their cherished critters into the plush, luxurious rooms and ample amenities. The hotel’s 373 rooms and 12 suites place its guests in the lap of luxury. All rooms feature breathtaking views of the adjoining golf course, or beautiful Hermosa Beach. Balconies, which come standard with all rooms, carry that delightful experience a step further. Guest Rooms are available with one King-sized bed or two Double-sized beds, complete with stylish and comfortable bed linings. Marble-finished bathrooms come equipped with premium toiletries. A large 42-inch flat screen HDTV features premium channels such as ESPN and HBO. Wi-Fi is available for a nominal daily fee. For travelers who crave a bit more splendor, Suites are available with amazing views of the surrounding countryside. With access to the executive Concierge Lounge, Suites also feature complimentary buffet breakfasts and complimentary beverages. Imagine gaining access to exclusive check-in, and upscale materials furnishing your room, and you’ll get an idea of the exquisite experience in a Suite. The jewel of this hotel is its sprawling, 9-hole golf course, a destination in itself. Complete with a golf shop, country restaurant, and rentals and lessons, the course allows hotel guests to completely lose themselves in endless rounds of golf. Guests who are looking to spike their adrenaline have access to a fully-equipped fitness facility, complete with sauna. Manhattan Beach, the breathtaking coast the hotel is named after, is only a 10 minute drive away. Hotel guests are more than encouraged to spend a day, or two, frolicking on its shores and taking in the sights and sounds. The Manhattan Beach Pier, famous for its vibrant energy, shops, and spectacular views of the California coast, is a must-see destination. And if guests were not yet aware, the famous Disneyland amusement park and star-studded Hollywood Boulevard are just a hop, skip, and a stone’s throw away. A full dining complement is available right in-suite, with room service providing buffet breakfasts, refreshing lunches, and lavish dinners. The in-house Manhattan Beach restaurant, with its beautiful views of the hotel’s golf course, serves wonderful American classic cuisine, in a casual setting with attentive and friendly staff. A whole host of the city’s finest restaurants are available just a short walk or drive away. 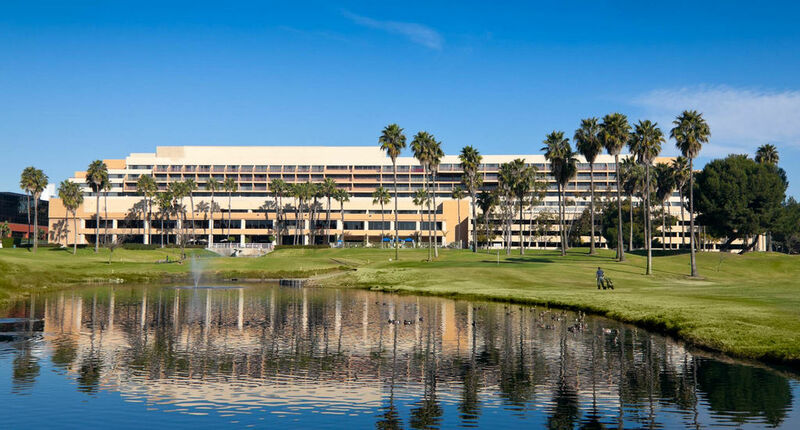 For travelers looking for a luxurious getaway that comes complete with a beautiful golf course and extensive amenities, the Manhattan Beach Marriott makes the ideal choice. The Southern California sun and surf call to travelers looking for both luxury and comfort, and this hotel provides a picture-perfect destination. Manhattan Beach Marriott is a luxurious golfing resort hotel located in the exclusive South Bay Area, just minutes from LAX airport and beautiful Hermosa Beach.